I started just prior vMotion being introduced. I was working for a loaning company at the time which was an early adopter of VMware. At the time I was lucky to be part of the project to upgrade to the latest version and saw vMotion for the first time. I knew right then this would change the way Datacenters would work. I had been working with VMware for a number of years now and had held my VCP since 3.5 upgrading it along the way. I figured it was just time to strive for my VCDX. Why couldn’t I reach the VCDX and what harm would come in trying. Little did I know where the journey would really take me. 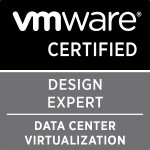 Between the VCAP-DCA, VCAP-DCD and VCDX the journey took me a year and half pretty well. My advice would be to go for it! It’s not an unachievable exam that sits on a pedestal. It’s a lot of hard work and time commitment but in the end the lessons you will learn while striving for your VCDX is priceless. You will become a much better architect and meet many others striving for the same thing which will only expand your network of professionals. The lessons learned along this journey will only better your career no matter where you end up going. Umm I don’t really know lol. I would probably focus more on my defence probably knowing what I know now. Also there would probably be sections of my design I could improve on. Life after my VCDX has gone back to normal for the most part now that the dust has settled. My company was very excited that I passed and send out a Canadian wide email so now there a lot more VMware questions being fielded my way lol. Was it worth it, yes absolutely! I couldn’t imagine the growth in my career or where an exam track would take me and am extremely appreciative of all of those who helped me along the way. I’m also beyond over joyed to have my VCDX # and am looking forward to seeing my Partner achieve his soon as well. Categories: Certifications, VCDX, Virtualisation, VMware | Tags: VCDX, VCDX Spotlight, Virtualisation, virtualization, VMware | Permalink. it is nice to see you getting VCDX#, I really appreiate your hardwork. I would also thank you for virtualtiers.net, hats off!!! !